Among the many things this project has taught me, is the importance of observing the sequence of events. At some point in the car's life, someone decided to relocate the radio antenna from its original location above the driver's side "B" pillar to above the passenger side "A" pillar. It looked like they had done this with the assistance of a can opener. One of the first body repairs I did a few years ago was to patch that gaping wound. I had not done the kind of job that would be unnoticeable under the final paint job, so I knew at some point I would have to revisit it. 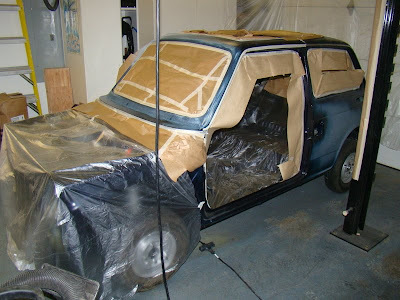 I've been trying to get the car ready for the windshield and exhaust system installations, and it occurred to me that I'd better get that old patch cleared up before a portion of it was covered by the windshield gasket. I've also been on the fence about the quality of the interior paint job, so I decided to sand, mask and repaint the visible surf aces while re-shooting the windshield bed. It was a lot of work for such a minor result, but I knew it would bug me later to see essentially textured paint while sitting in the car, which I hope we do a lot. Here's a little video of my folks taking Matilda around the block. I love the perspective as they drive past full size vehicles. It only took four years, but Saturday the dream came true, and we drove Matilda! The weekend began with my dad and nephew coming to help get this show on the road. I was pretty sure all that needed to be done before we could get rolling, was to bleed the brakes and adjust the clutch. I was a little nervous about the brake bleed. I had gone through the whole system and replaced or refurbished every component I could. I bent new brake lines, rebuilt the calipers, replaced all the hoses with brand new stock and replaced the master cylinder with a rebuild. I knew that I would have a potential leak at every one of the several double-flared fittings, as they are notoriously difficult to get right. As a matter of fact, I did have a few leaks, but they sealed up with a few additional wrench turns. Actually, it's been sort of magical how everything that looks like a problem seems to work itself out. Besides the brake leaks, the charging system didn't charge, the transmission wouldn't go into reverse and a needle valve in the carb stuck closed. All of these issues were fixed so easily, that it was almost worth having the problem in the first place, if only for the satisfaction. The one thing that was an issue, and still is, is the brake vacuum booster. It's amazing that a car this size has power-assist brakes at all, but when the booster doesn't work, you sure miss it. I've got emails out to the N600 gurus looking for suggestions. I could probably bypass it, but as just about every other little detail on this car is working, I'd like this to operate too. I learned an exciting statistic while doing a little online reading. It turns out that of the 40,000 plus N600s sold in the US, roughly 1,000 remain. Of those thousand, about half are restorable, and of those only about 300 are drivable. I had no idea this would be such a rare and special car when we got started, but I'm looking very forward to spreading the joy when it hits the road for real. Let The Body Work Begin! I've been looking at two dents in the roof for about four years now, and I decided that today was the day to do something about them. Their size and spacing suggest that someone made an ill-fated attempt to put a roof rack on this car. Clearly, if you have furniture to buy, you should take something else to Ikea. When we first acquired this body, I attempted to get a few different body tools into the tight space beneath these dents to no avail. This only left me with one option: I needed a stud pin welder! This is one of the better inventions to happen to the auto body industry in the last generation. You simply load a small copper-coated steel pin into the gun, press the tip into the lowest point of a dent and pull the trigger. In less than one second, you have something to attach a slide hammer to, and voila! It actually takes several of these pins to work the dent out, but it is very effective, and a lot of fun. Fortunately, I'll have plenty of chances to use it, as the body has a few wrinkles. Once the dent is within 1/16" of flush, the Bondo may be applied. 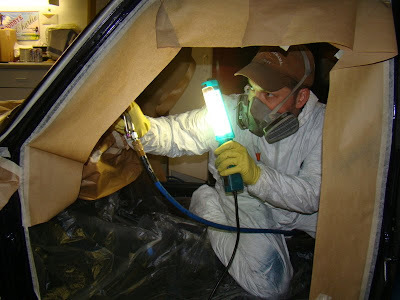 I worked for most of a year in a body shop in my early twenties. I learned a few basics (mostly enough to get into trouble) but never had enough practice to get really good at body and paint work. As for the body and paint on Matilda, I've decided to give it a shot, but it is notoriously difficult to make dark colors look good. I figure if I'm patient and don't mind redoing, and possibly re-redoing some things, I may have a chance at getting it right. If that doesn't work out, I may have to leave it to the pros.